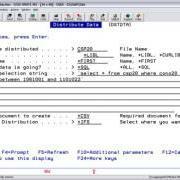 Have you ever wanted to extract some data out of an IBMi/AS400 file using SQL and then email that data to someone as an Excel Spreadsheet? I added this new function to the PROJEX4i – Distribute Data command last night – so it can now take a bite of selected data using SQL and send it as a TXT, CSV, XML or PDF as EMAIL. Huge time saver for me and has been on my wish-list for ages. This captures the list of data selected by your SQL statement, converts that data in a spreadsheet and saves it in the IFS – then it convert the spreadsheet to the format you selected (plain TXT, PDF, XML, CSV) and emails it directly to the address you specified on the command using the IBM i SNDSMTPEMM command. The new version allows you to choose between using SNDSMTPEMM, MMAIL and SNDDST as your email delivery mechanism. It’s a thing of beauty. Hope it helps somebody.